probably the most attractive man I have seen yet. Rugged in Paris. but i think the man in the olive shirt steals this photo in a way. Such beautiful colours on such a beautiful man! I'm not a big fan of beards, bit alright, I have to admit it: it suits him just fine. Love his haircut too! Nice jackets, but, no more pictures from SPAIN? It's like the early Star Trek: Next Generation dress uniform, only in plaid. I'm not a fan of this jacket. The amount of fabric in that plaid is giving me a tablecloth feeling. Sorry. Beautiful man, however! I am not sure if the jacket is nice, or not………but he is so handsome!!!!! I like that this fabric has a nice taffeta-look to it. Nice and daring! Yes, a very handsome man. To me the jacket looks like Grandpa's night shirt. His coat rocks ! Wow ! Takes a lot of style to wear this (right) ! (Women's CashTouch . . .) that is almost the exact plaid. Not really going for this jacket…the man, yes, jacket, no. Maybe if it was about a foot shorter it wouldn't look like a lumberjack's pajamas with a collar? cute guy. hideous coat. maybe…maybe if it was jacket length, it might be okay. but that long. yeeks. I actually think the man to the right of the featured coat is much more interesting! The coat man's "mom jeans" just aren't doing it for me. that plaid is awesome. wish I could see the pants, i love light wash jeans on guys! lekisskiss.blogspot.com <– our site got a face lift, check it out! He looks like he must smell nice. A very well-kept and handsomely groomed man – the facial hair is intentional, not just roll our of bed mess! The coat is maybe too plaid but notice the light blue pants and shirt? This man is in france but looks totally italian. When the picture first revealed itself on my screen (top down), I was steeling myself to handle the plaid as a jacket. I was not prepared for the full-length coat. Too much plaid for me. Oh, but he is very handsome and masculine, and his choice represents him as confident and daring as well. This is what personal style is all about, to push it and not care, love it. He looks GREAT! Love it! LOVE it! Love HIM. The jacket is just a bonus!! This jacket is terrible! Do any of you notice fit and cut? Its like the guy put on a box. The textile is quite nice but the rest is a mess. I love the guy next to him though. He's probably a guy who looks good every day without trying to stand out once a week. Its what I do. Look nice every day and people will notice. Look good once a month and people forget quickly. only a man this handsome could get away with this coat!! Interesting jacket and he pulls it off amazingly well! I like this coat but it would look much better worn with dark colored pants particularly navy blue. With the jeans he is wearing it looks , well I hate to be harsh but cheap and tacky. I love everything going on in this shot. Wow! I just got my new GQ today, and guess what picture was included in The Sartorialist section of the magazine? This one! I love this mans coat so much! Super original and very eye catching. The colors are so warm and I want it. the guy in the back has cool hair. Great capture!!! Very unique jacket! Mad for plaid!!! Heellloo!! !With that jacket you couldnt hide in a crowd if you tried. Love! I love the grey and orange sweater on the man in the background. The gentleman is attractive but that "jacket", not so much. It reminds me those plastic laundry bags that you can buy from Tati. You can find them all over Paris. It's just too much for just two eyes. Who is looking at the jacket? Handsome man. Nice coat, it can double as a picnic blanket. Extra long for extra style. not loving this look. the olive shirt steals the photo. to be honest i don't really like the jacket. but the color is beautiful. what i like most is the man. look at that matured face. beautifully tanned skin. isn't he perfect everyone?? He is really handsome in such a fancy trench!! Is it just me? I hate this coat, reminds of a tablecloth pattern in a sad italian restaurant. Please! It's Dario of peacoat fame again. Well You cant say he doesn't stand out from the crowd. that plaid in a sea of black jackets could look very out of place but somehow he just makes it work! This is a cool jacket with a classic plaid pattern. But…He is wearing a plaid ? Très courageux. I love plaid but I'm not going crazy for this jacket, at least not as a jacket – I want to put condiments and placemats on it. As others have said though – what a beautiful man. Old-school handsome, like Alain Delon but with real 70s ruggedness going on. He's put colour in my cheeks this morning! The leather jacket is better. this plaided wonder is very dangerous to wear. You have to be at leat 1,80m and slim, otherwise it will look like a bathrobe. I assume the plaid coat is the primary subject, but I really like the dark blazer with the subtle pocket square. Nice hair, also. so incredibly handsome mens in this picture. cant stop looking at them. thank you very useful trick..
Love this blog, one of my favorites, but this jacket however is not. To much going on for me. i love guy that behind him. he look cool. He is so handsome it almost doesn't detract … but it's a battle. I'm not really going for the jacket..I like the guy in the green t-shirt&black blazer better. Yes- man in olive tee & blazer steals the shot. Got a # for him? I do not like the coat, but I do like the fact that he wore it. To me, it embodies a "well, *I* like it, so get stuffed" sort of attitude. Which I should adopt more often myself. For me this picture is all about the guy in the back with the blazer & t-shirt…. Much better than the grungey leather jacket guy….. I do love this jacket. He's a very good looking chap but even he can't get away with wearing a badly cut tablecloth. I love this jacket too! But i also really love the blazer on the gentlemen in the background. Not feeling any love for the jacket. As mentioned above, terrible fit. And the color pattern is obnoxious. Personally, don't like the jacket, it looks stiff. And I don't like the plaid, reminds me of the inside of a sleeping bag. can anyone ID this coat! This is the best time to accessorize! Wearing layers becomes necessary to keep warm, but it gives you so many opportunities to wear great pieces without covering them up. It isn't freezing yet so you're not concerned with wearing the warmest possible coat and you can wear the coats you kept away all summer! Such a handsome man! He even looks good in my grandpa's nightshirt. where is the Spanich pictures? I remember him from before…forget his coat I would run away with him as he is extremely attractive. Okay his coat is great but I prefer the navy one on him..and the shirt combo! This jacket is LOVE!! Plaid is my poison! Although I LOVE looking at all the comments of "I love this" or "I hate this" style, I am forever dazzled by your eye for the expression of your fellow human being. You (and Garance) sing me to life visually every single day. Happy Thanksgiving and cheers!!!! even on a picture he looks charismatic and handsome…grrr why are only the happy few blessed with this gift?! bihind him…cool et chic au meme temps. This guy with a trendy jacket looks like Hugh Jackman. actually what really captures my eye is the man behind him who wears a tuxedo jacket and a green t-shirt…that´s style! …everyone can wear a tuxedo jacket and t-shirt…this is not style! 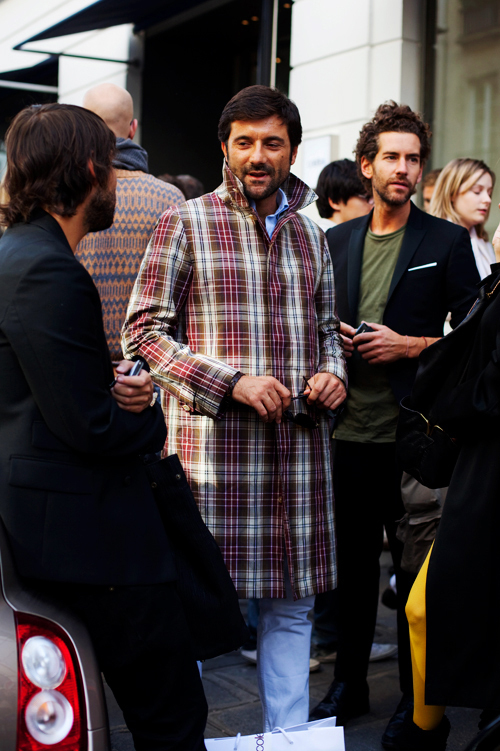 I love the coat and they way he is wearing…Dario has a personal style! wonderful..!!!!! just for special people…..
You do not see that everyday. That would be great had it been shorter, ending at the hip. Only 1 other person thinks he looks EXACTLY like Hugh Jackman?! Haha! He's a dead ringer! Very handsome, indeed! Um… I think you should have a shorter jacket when it has such an aggressive print.